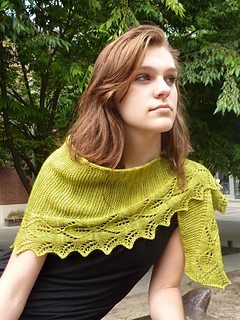 Garland is a crescent shaped shawl, knit from side to side. 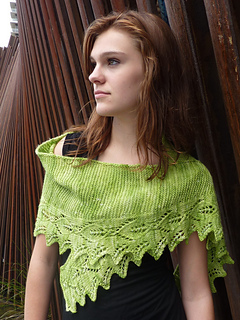 The lacy border is knit at the same time as the garter stitch body, which increases from one end to the center and then decreases to the other end. Optional beading along the leaves’ center veins adds sparkle and weight for drape. 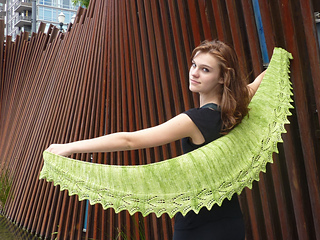 This shawl can be knit as a wide, shallow crescent, or a deeper, more traditionally shaped crescent. Knitter’s choice! Wide shawl requires 300 size 6/0 or 8/0 seed beads. 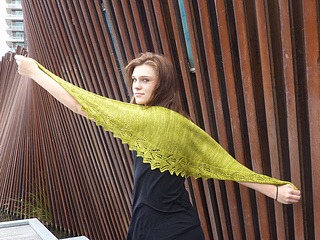 Narrower shawl requires 270 beads. Gauge is not critical on this project, but you do want to not go too far astray so you know you have enough yarn to complete the project. Note: stated gauge should be in garter stitch, not stockinette. Have more or less yarn? 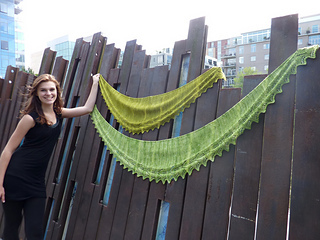 See this blog post for ways to make the most of the yarn you have for this project.